The new kid on the block, Pinnacle/Synergy, proved today that an out-of-town team can be competitive at the Dome. But in the end, Adam's Test Team was just too strong. "We pushed and pushed and eventually we wore them into the ground," says Adam's Danny Frederick. "The Metrodome is a very unforgiving place." The Adam's team passed Pinnacle shortly after the start of the 70-lap race. "And then they drafted us for the next 15, 20 miles," says Frederick, who flew in from Maple Valley, WA, for the race. Adam's tried a tactical trick to shake Pinnacle. Midway through the race, it popped in for its mandatory water stop and then popped back out right behind Pinnacle. But Pinnacle took its water stop on the next lap and got behind Adam's again. However, Adam's continued to push the pace and eventually pulled away from Pinnacle. The Adam's team posted a time 20 seconds faster than Pinnacle's. Max Muscle finished thee minutes later in third. Hoigaard's was fourth. "The real hero was Tom Peterson," Frederick says. "Even though his name won't appear in the results" — because he dropped out near the end of the race — "he's the one who pulled the most fast laps for us." The other team members were Peterson's wife, Kara, David Sarmiento and Matt Meyer. "Tom and Kara and David pulled us to the finish ... but mostly it was Tom," Frederick says. It was the second straight win for Adam's in the Metrodome team time trial. Adam's Test Team is the first squad to cross the finish line. Pinnacle/Synergy finishes about three minutes later. But it's still unclear who won because Pinnacle started about three minutes after Adam's. However, Adam Bradley is pretty confident that his team won based on its lap times, which were consistently faster than anyone else's. Early in the race, the team was posting lap times of 56 and 57 seconds. Tom Peterson was doing a lot of the hard pulls, Bradley said. This apparently took its toll because Peterson dropped out at about Lap 55. Adam's Test Team is extending its lead. After 55 laps of skating, it is 45 seconds ahead of the second-place Pinnacle/Synergy team. "We keep getting further ahead," says Adam Bradley. None of the Adam's skaters have dropped out, which means the team is still at full strength. Meanwhile, Pinnacle lost Hernan Diaz and Hoigaard's lost Chad Johnson. After 48 laps of skating, Adam's Test Team is about 20 seconds ahead of the new Pinnacle/Synergy team. And the much feared Hoigaard's appears to be dropping out of contention. That's the word from Adam Bradley in the concourse. "It's very close," Bradley says. "But it looks like we're pulling away." The same Adam's team won the time trial last year. It's roster: David Sarmiento, Danny Frederick, Matt Meyer, and Tom and Kara Peterson. 2:30 pm | Ron Marfori won the solo marathon ... ? "I think that I won," Ron told us a few minutes ago from his home in St. Paul. Nobody's absolutely sure yet because the timing company's computer lost track of the laps near the end of this morning's pro solo marathon. Marfori, skating for Twincam, and his teammate Andy Uttke, had passed everyone in the field and were skating with Powerslide's Steve Meisinger, who had started before them. So they assumed they were in first and second place. Uttke's wife was counting laps on the sidelines, so she was able to let them know when they were done. "We skated a couple extra laps just to be sure," said Marfori, a 33-year-old project manager for a web development company. The race director has called the teams to the starting line. So the first team should be set out on the concourse in about five minutes. Teams are required to register five skaters for the race, but they can start with four. They are set out on the racecourse one at a time with a few seconds between starts. Team members must skate together in a pack. 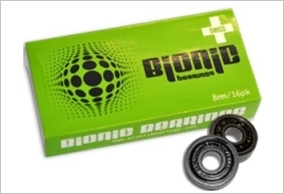 If a skater drops back, he or she must immediately leave the race. Teams are not allowed to draft each other. The time of the fourth skater in each team to cross the finish line is the team's time. We are still waiting to find out who won the solo marathon for pro skaters. But in the meantime, we've got some news about the team time trial, which is scheduled to start in two hours. Another pro team has entered the race: Pinnacle/Synergy. The team is made up of Ty Fidler, Bill Numeric, Brian Oswald, Jeffery Neal and Hernan Diaz. The team looks strong; and while it is new to Dome racing, it may be able to hold its own against the two favorites: Adam's Test Team and Hoigaard's. It's shaping up to be a very good race. 10:40 am | Who won? No one is sure at this point — even the skaters can't tell because they don't know how many seconds apart they started on the concourse. Nonetheless, it appears the winner is either Andy Uttke or Ron Marfori — at least that's the best guess of our correspondent, Adam Bradley. Adam Inline's David Swan just finished the race. He says he skated two extra miles to make sure he completed all his laps. ... So there is some confusion here. There is some confusion of the racecourse now. The organizers say they have lost the lap counts, but they are asking the skaters to keep going. The top skaters should be finishing their 70 laps in about 10 minutes. John Schulte, Ron Marfori and David Swan look to be the fastest skaters on the concourse at this point, Adam Bradley says. But it's impossible to tell who's in front without a lap count. The race started about 20 minutes late. As usual, the skaters were started one at a time to avoid congestion. The fastest skaters quickly formed into two packs of five within sight of each other. Race rules limit pack size to five skaters to limit congestion and require packs to stay one doorway apart on the concourse, unless they are passing. The doorways are about 50 feet apart. "When they get closer than that, they get yelled at (by the race directors)," says Adam Bradley. "And there is a lot of yelling going on." The competitors skate 70.7 laps of the concourse in the full marathon. Skaters are waiting for the start of the first solo marathon, which has been delayed for 15 minutes. Adam's Test Team has revised its roster for the afternoon team time trial. It has replaced Andrew Peper with Danny Frederick. Therefore, Peper will be skating the solo marathon. Other strong men in the solo marathon include: David Swan (Adam's Inline), Andy Uttke, Ron Marfori and Jack Wussler. The only pro woman appears to be Sarah Brown. 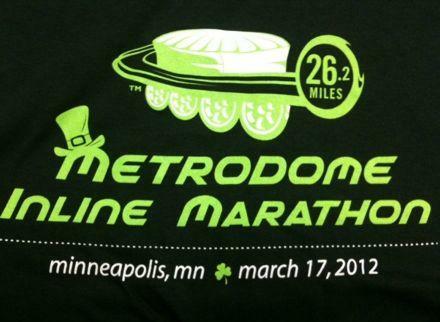 It's the St. Patrick's Day Metrodome Inline Marathon. The Metrodome logo is wearing a leprechaun hat. The race t-shirts are green. And lots of the skaters are wearing green. "They were thinking of making the water green, but they figured no one would drink it," says Adam Bradley, owner of the Adams Inline store. The first solo marathon is scheduled to start in 15 minutes. The most popular wheel is the Blacktrack. But MPC quit making that wheel. So skates are defaulting to their second choice: the Atom Burn.